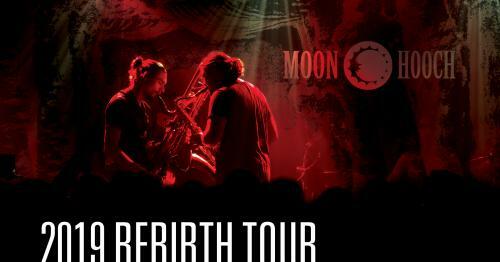 On Tuesday, March 12, the Community Center for the Performing Arts and KLCC proudly welcome Moon Hooch to the WOW Hall along with special guests Elena Shirin (of Aramboa) and Kulululu. If any band is a poster child for turning the power of positive thoughts and intention into reality, it’s the explosive horn-and-percussion trio Moon Hooch. In just a few short years, the group —Wilbur, fellow horn player Wenzl McGowen, and drummer James Muschler — has gone from playing on New York City subway platforms to touring with the likes of Beats Antique, They Might Be Giants and Lotus, as well as selling out their own headline shows in major venues around the country. On Red Sky, Moon Hooch blends elements of virtuosic jazz, groovy funk, and pulse-pounding electronic dance music. The band’s third album brings together the raw, transcendent energy of their live performances and the sleek sophistication of their studio work into a singular, intoxicating brew. Though the band — whose members initially met as students at the New School — turned heads in the music industry as relative unknowns with a charismatic, unconventional sound (they play with unique tonguing techniques and utilize found objects like traffic cones attached to the bells of their horns to manipulate tone, for instance), they were already a familiar and beloved sight to straphangers in New York, who would react with such joy and fervor to their impromptu subway platform sets that the NYPD had to ban them from locations that couldn’t handle the crowds. The band’s busking days are behind them now. At their performances, they now play through what they call a Reverse DJ setup, in which the live sound from their horns runs through Ableton software on their laptops to process recorded effects onto the output. In addition, to flesh out their sound on the road, the band began utilizing Moog synthesizers, an EWI (an electronic wind instrument that responds to breath in addition to touch), and other more traditional instruments like clarinets. Wilbur added vocals to his repertoire (something the subway never allowed him to do), and Muschler, meanwhile, traveled to India to expand his percussion skills. Elena Shirin is an Austrian rooted artist, singer and songwriter performing her as yet unreleased debut solo album in the USA. Elena started to play piano at age seven, but instead of reading music she just learned by ear and created her own notation system to pick up the highlights of her improvisations. Five years later a traumatic experience led Elena to write poems. That way she could reflect and process present emotions. She discovered melody, rhythm and dynamics behind those lines. This was Elenas’ very instinctive origin of creating music. While studying photography and audio-visual Media’ at Höhere Graphische BLVA in Vienna, Elena started collaborations with different musicians and producers. By the age of fifteen her first airplay followed on RadioFM4. In the last couple of years the 22 year-old kept her main focus on the band project Aramboa. Electronic beat patterns, distorted guitar licks and warm horn sounds circulated around Elena’s voice and lyrics. After dropping their debut album in 2017 and several singles in 2018, they are now working on their second record. Fusing live instruments with high-end electronic music, Elena’s solo album From A to Be reflects her skills of sound production and composition. This record also represents a very subtle diary of Elena’s art of living, as the album name implies. Tickets are $12 in advance, $15 day of show. Doors open at 8:00 pm and showtime is 9:00.